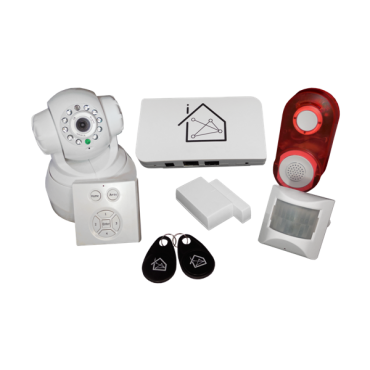 Extended Security Package | BeNext B.V.
With this Extended Security Package of BeNext any unwanted activity in and around your home or office will be detected. The package contents will give you the means to secure doors and windows with the Door Sensor, which observes the open/closed status of any door and window. In case of unwanted activities you can set our Alarm Sound so that an alarm will sound with 100 Db while, on the same time, the Moving IP Camera starts rolling live imagery directly to our secured server. The sound of the Alarm Sound is made to scare away any intruders, but also can be used for other functions that can be customized within our free of charge online manager. Secure complete area’s with our Molite Sensor. Activate or de-activate alarm status simply by changing scenes, using your smartphone, tablet or PC. You can also quick start any security measures by using your RFID-Tag and swap it past the Tag Reader. To give an automation example; activate or de-activate the alarm automatically with the rhythm of sunset and sunrise by letting the Molite Sensor react to the intensity of light!